"No madame. That's a mackerel." Those lines from The French Chef in America got a good chortle from me. I got the book, authored by Alex Prud’homme to review. Or actually, I got the audio book version. Which was completely different for me. I've never listened to an audio book before. I like to read. It took me a while to settle in to listening to the book. Some folks listen to audio books while they drive, which makes sense. I wanted to do something else at the same time. I had nowhere to drive to. If I knitted, that might have been a good activity. Instead, I pulled out a coloring book. That worked well enough. The good thing about listening to this book was that the author used a nice French accent when pronouncing French words. The bad part was that the book was 11 hours long. I could have read it in less than half that time, and I probably would have skimmed over a lot of the lists the author was fond of. The other bad thing was that there was no way to search through the book after reading to find good quotes for this review. I wrote the one at the top of the review as soon as I heard it, or I never would have remembered it. 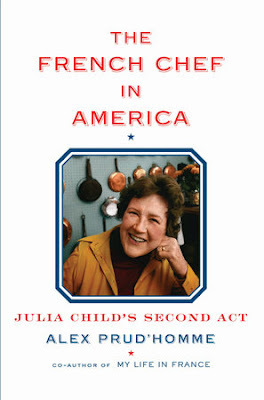 The story is basically the continuation of Julia Child's life, after she moved to America. But instead of being in first person, this was written in third person. There are also some forays into the lives of people she knew. Like Jacques Pepin. I found out that he had worked for many years for Howard Johnson - and he liked that job. There was also quite a bit about Sara Moulton, who I'm quite fond of. And of course, there was quite a bit about other people in Julia's life, like husband, her co-author, and her editor. The insight into her work on the televisions shows were interesting. I never realized she had to do her own fundraising to get the shows aired! And even better, she loved the Saturday Night Live skit about her, and even kept a tape of it that she occasionally played for friends who came to visit. I love that she was amused rather than annoyed. If you're a fan of Julia Child, I'm sure you'll love the book.